These savory, peppery crackers will wake up your taste buds. They make a tasty snack paired with cheese, nuts, or fruit, and are a great addition to an appetizer platter of sliced meats, olives, and cheeses. 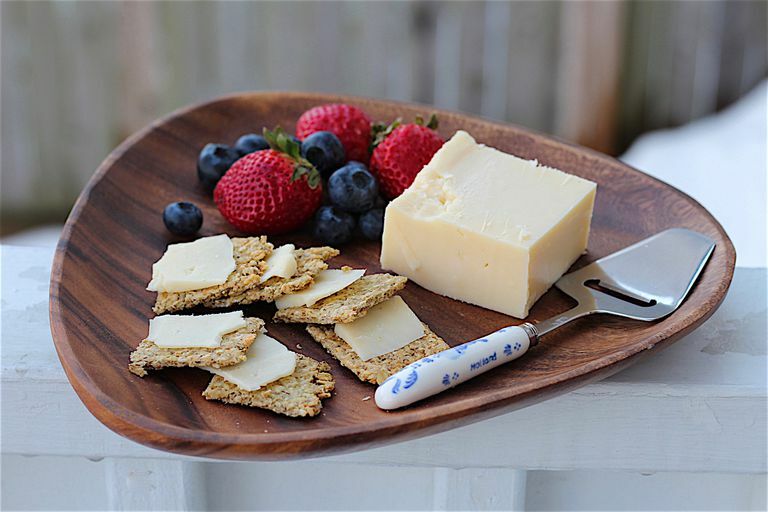 Oat crackers are often found in gourmet stores, but they can cost a small fortune Yet, they are very simple to make yourself and can be infinitely varied with the use of different herbs and cheeses. Grind 3/4 cup oats in a blender or food processor for 1 to 2 minutes to make oat flour. The flour should be slightly coarse. In a large bowl, combine the oat flour with the remaining oats, baking soda, salt, pepper, sugar, rosemary, and Parmesan cheese, and mix together. Add the olive oil and boiling water to the dry ingredients and mix. Knead the dough with your hands until a slightly sticky ball of dough forms. Let the dough rest for 5 minutes to hydrate the oats. Add more water a tablespoon at a time if it is too dry; if it is too sticky, add additional oat flour or whole oats. Cut two large pieces of parchment paper. Place the dough ball between the pieces of parchment paper, on a large cutting board or flat counter. Roll the dough out to a 1/8-inch thickness. Peel one layer of parchment paper away from the surface of the dough and use a sharp knife to cut the dough into 1-inch strips. Then, cut strips crosswise into 1 1/4-inch squares. Remove the crackers from the parchment paper and place them on two ungreased baking sheets with about 1/2 inch of space in between. Bake until the bottoms of the crackers have darkened a shade or two and the tops are dry, about 12 to 15 minutes. Flip the crackers over and bake for an additional 5 to 7 minutes, until crackers are very dry, and golden brown on the edges. Crackers will crisp up as they cool. Store in a sealed container at room temperature. We use fresh Parmesan cheese shredded on the medium holes of a box grater for this recipe. Or, purchase pre-shredded long shards and chop them into smaller pieces before measuring. You can also try Romano cheese instead of Parmesan. Instead of rosemary, use different dried herbs, such as basil, oregano, or thyme, either singly or in combinations. Spices like smoked paprika, cumin, or coriander can provide more exotic flavor. Use cayenne pepper in place of black pepper for assertive heat. To make this recipe gluten-free, use gluten-free oats. If the dough cracks as you work with it, don't worry; it is very forgiving. Just pinch and pat cracks and holes together with your fingers, using small pieces of extra dough as patches. Cutting scraps can be pressed together and re-rolled. If dough has dried out, knead in a few sprinkles of water.